What is Optima-CRM? A practical Real Estate CRM solution which covers all commercialisations needs in your business. 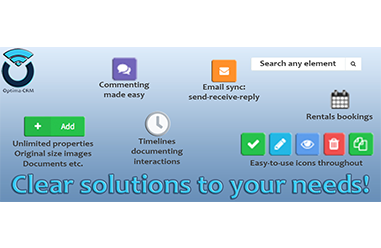 All your properties, contacts, transactions, etc., are perfectly organised in one place. you can customise many elements and contents to match your needs. day-to-day activities, both in the planning as the execution thereof. Visit our new FAQ page and have more questions answered.